On the heels of Mardi Gras here in New Orleans, we can’t think of a more festive Squid to spotlight. Get to know this Vassar grad who is bringing some theatricality to TurboSquid and the city that he now calls home. What’s with the multiple nicknames? My friend and I were on a road trip to a juggling convention where everyone has awesome nicknames so we made them up on the drive. My friend is “Bambi” and/or “Panda,” but I’m pretty sure these only lasted about 20 minutes. Aren’t you involved in the circus, too? Tell us about some things you do outside the office. I’m a huge fan of the circus, as I’ve been in Vassar’s Barefoot Monkeys Circus Troupe for the past four years. More recently, however, I’ve slowed down on my fire spinning and juggling—although I’m going to juggle seven in the year—and I’m doing improv at The New Movement Theater (which also is in Austin). Of course this adds up to the fact that I’m a Venture for America Fellow, and I’m pretty keen on engaging New Orleans in a positive way that adds value. I’m a huge fan of design thinking, and I’m about to start a human-centered design meetup group to unbundle how we might help the city. 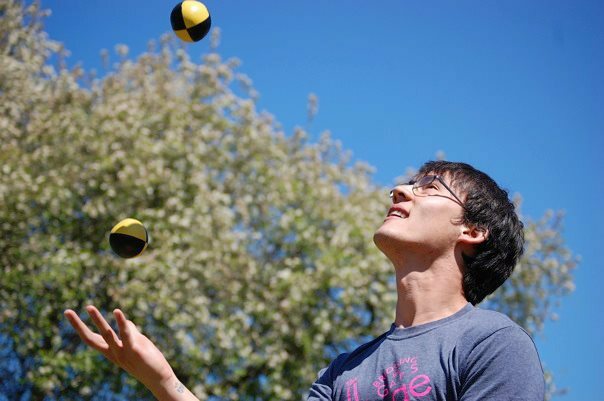 What sparked your interest in juggling? Who doesn’t like juggling? One day I saw some jugglers in the park having a blast and I jumped right in! If you’re on the east coast looking for a good time, you can pay a visit to Vassar College on any given Wednesday or Friday; you’ll be greeted with open arms and can juggle with new friends! In fact every juggler and fire performer I have ever met has been very friendly and a wonderful person. If you want to learn, just ask! How’d you get involved with Venture for America? Venture for America takes recent graduates, from undergrads to PhDs, and sets them up with a high-growth start-up – like your friendly, neighborhood TurboSquid – to inspire us to become awesome, entrepreneurial-minded human beings. Regarding how I became involved, I wish I could tell you a flashy story involving breaking into a start-up conference, masquerading as a Venture Capitalist, and immediately getting signed on as VFA Fellow (my lifelong goal) but in truth, I was planning on going down the completely different route of actuarial science. In one of those spur-of-the-moment decisions I decided to attend a talk on this strange new program called Venture for America, and all of a sudden I was blown off the insurance route (the main proponent of actuarial science) and have trailblazed ever since. Scoot into the Squid Shack, grab a bowl of Luck Charms—hoho! More marshmallows than yesterday? I think so! Chat with Adele, our VP of Marketing, about Entrepreneurship, greet the desk mates, hop onto the computer, and kick up Excel, R, and SQL Server. I’ve got my headphones in with The Stanford Ecorner or an audiobook on play. Break for some design meeting where we discover that the name of the project has changed yet again, and we talk about edge cases of animal taxonomy: How do we classify BearManPig on the site? Is it a Bear, a Man, or a Pig? No it’s a BearManPig! Stay in late to ask questions on StackedOverflow. Chat with Jonathan Lloyd, my boss and the VP of Product Development, about TurboSquid in the bar downstairs, then, depending on the day, go through some of MIT’s OpenCourseWare. Head over to The New Movement Theater for improv, or go rock climbing with Mark. Get back home, fix some dinner, work on a personal project, and crash for the night. Do you have a favorite model? 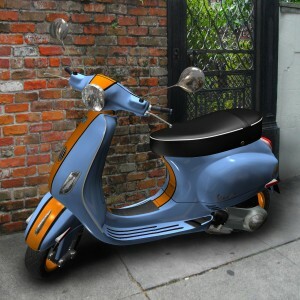 On good days (aka when he doesn’t break down) I ride my 10-year-old scooter, Jeremy, into the office. This is Jeremy. You might wonder, this is silly it’s just a 3D model. You’re wrong—I ride this to work every day. Jeremy breaks down a lot. I’ve seen Paul Teall tiptoeing down to the parking lot. I swear he’s taking out screws. His hands look like they’ve got smears of engine grease. For those unfamiliar, Paul Teall is our unofficial Fantasy Football Manager who everyone will become acquainted with in a later blog post. Think you’re a fit for our crazy krewe? We’re looking for a few good Squids. Be sure to check out our current job openings.